The most common reason that ukuleles go out of tune is due to the nature of nylon strings. Nylon stretches and takes a while to settle down. This is particularly noticeable when you have a new set of strings on your ukulele. As the strings stretch the tension drops and subsequently the strings go out of tune. There are 3 main ways to get your ukulele in tune. I’ll start with the simplest but it’s worth getting to grips with each method (you never know when you’ll need to know). If you’re new to ukulele I would 100% recommend buying a clip-on tuner. This little device which costs anywhere from £6 to around £20 clips on to the end of your ukulele, this isn’t just so you won’t lose it although that is a pretty handy feature. They generally work by vibrations and don’t have a microphone so once you clip it on, leave it there and it will always be around when you need it. Do make sure when you’re buying one that it works for ukulele, not all of them do. To get tuned up with a clip-on tuner I’d recommend starting with the 1st string (the one closest to the floor when you’re holding your uke like you do when you play it). Play the string without fretting any notes and look at the tuner and watch what happens. For standard tuning the note you’re seeking is A. The clip-on tuner will show the A note and provide some kind of visual aid to show whether the note is flat (too low) or sharp (too high). It usually takes the form of a needle, or sometimes a series of bars. If your tuner shows the note A but the needle is to the left, you need to twist the tuning peg so that it tightens the string. If it shows the note A but the needle is to the right then turn the tuning peg so that it loosens the string. Watch the tuner as you do this and adjust accordingly. Once you get the needle/marker in the middle (and sometimes a green light), you’re done – move up to the next string. You then need to repeat this process for all the strings. Starting at the bottom string and working up the final notes should be A, E, C and G.
Give your uke a strum when you’re done and give yourself a pat on the back – well done! 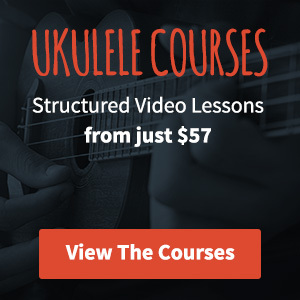 You’ve learned how to tune a ukulele! Even if you’ve got a clip on tuner I’d highly recommend grabbing an app for your smartphone (assuming you have one). You never know when someone will hand you a uke and ask you to bust out a tune, funnily enough people are never that impressed when you tell them you can’t as you don’t have your tuner with you. The difference between a smartphone tuner app and the clip-on tuner is that the smartphone app uses your phone’s microphone and not vibrations. This means its a good idea to get your phone as close to you ukulele as you can. Aside from this the tuning process is exactly the same as above. If you don’t have access to a clip-on tuner or a smartphone app and need to get your ukulele in tune then fear not! You can do it the old-fashioned way and use your ears. I’ve recorded 4 audio clips below. The first audio clip is me playing the A string on a soprano ukulele. Play the clip and listen to it a few times. Get the familiar with the note. The A string is the closest string to the floor as you hold your ukulele in the playing position. Pluck your A string (without pressing any frets) as you listen to my recording and try and match the tone. If it’s too low, tighten the tuning peg a little. If it’s too high, loosen it off. On to the next string up (second from the floor). 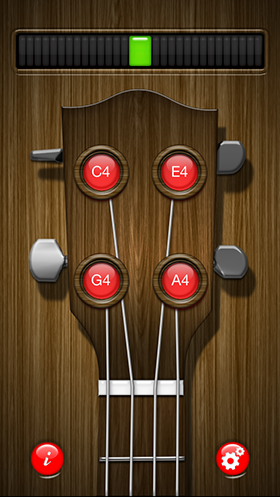 Again listen to the audio file and attempt to match the tone by turning your tuning page and plucking the string. You’re past the half way point now. The C string is the 3rd one from the floor. Repeat the same process as you did with the other two strings. Finally on to the G string (the one closest to the ceiling). It’s the same process again. Notice the sound of the note is much higher. Now give your ukulele a strum. How does that sound? Hopefully pitch perfect! If you’d like a longer explanation of this process, you can visit the following page to help tune your ukulele to itself. So there you go, you’ve got no excuse for having an out of tune ukulele any more! VERY HELPFUL!!!! Thanks much! Old dog learning new tricks!